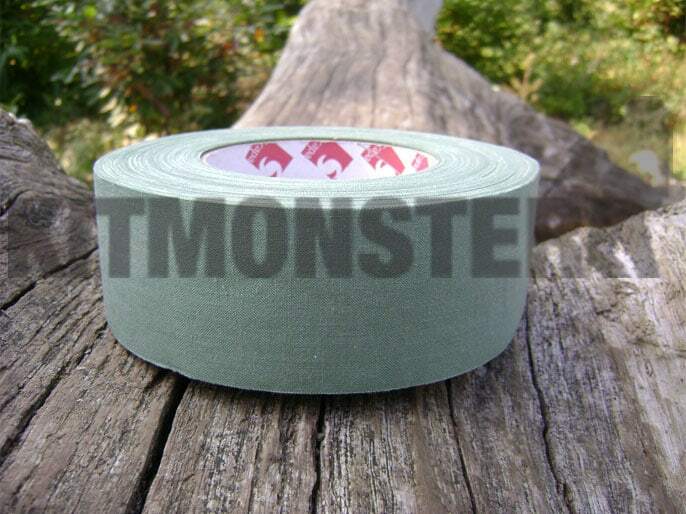 Olive Green cotton fabric Sniper Tape. The covetted original issue item, known as Sniper tape, NBC repair tape and even Scaley tape. Call it what you like, this is the ultimate multi purpose military tape. Slowly being replaced by the shiney gaffer type tape so buy it while you can. Large roll, approximately 50 metres by 5cm, complete roll weighs 577grammes. UK made cotton based plain olive green. Use for camming up your life, running repairs on kit or just to write your name and blood group on. No shine, no straight lines in your camo, can be painted, sprayed or splashed with mud for extra disruption. Purchased from a surplus source, these show do signs of transit and storage. Especially favoured by sniper teams who slap it all over their L115A1 rifles and optics, essential kit for the Commando course; unless you really want to paint your flask and toothbrush?